Preheat the oven to 425. Oil two 8- or 9-inch round cake pans and line the bottoms with circles of parchment paper. Put the polenta ingredients into a large microwavable casserole dish or 1-quart measure. Cook at full power for 4 minutes. Stir well and cook again at high power for 2 more minutes. Stir again and cook at high power for another 2 minutes. Remove from the microwave, stir in the optional oil, and beat with a spoon until completely smooth. Spread the polenta evenly in the bottom of the two pans. (If you have any leftover, save it for another use–or make another small pizza.) Place the pans in the oven and bake for 12 minutes. While the crust is cooking, prepare your toppings and sauce. I used a simple tomato paste-based sauce (3 tbsp. paste, 2 tbsp water, garlic, oregano, basil to taste) because I wanted something thick and not watery. Your favorite spaghetti sauce can be used. Sauté the vegetables lightly in a non-stick pan until onion begins to soften. After 12 minutes, take the crusts out of the oven and invert them onto a large baking sheet, side by side. They should fall right out of the pan with the parchment paper stuck to them. Peel away the parchment. 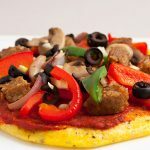 Spread each crust with pizza sauce (don’t use too much or they will be soggy) and top with veggies and vegan sausage. Sprinkle with chopped garlic. Return to the oven for about 10 minutes, until toppings look done. Lift off the baking sheet carefully using a large spatula and your hand–they are not sturdy like regular pizza, so be careful not to let your toppings slide off. Cut into 4ths and serve.